A common question asked by many new investors is this whether a stock is worth buying if it does not pay dividends. After all, if a stock doesn't pay dividends, isn't buying it sort of like participating in a Ponzi scheme because your return depends on what the next guy in line is willing to pay for your shares? That is a very good question and it's important you understand the answer. Dividends are a great source of return for shareholders, especially when combined with dollar cost averaging. But a company doesn't need to pay out dividends to be worth investing in. To help explain non-dividend paying stocks and how they can benefit your portfolio, I created the following story to make this somewhat difficult topic easy to comprehend. In short, this tells the story of why re-investing profits instead of distributing dividends can work out very well for shareholders. Imagine that your father and your uncle decide that they want to start a farming business. They each contribute $150,000 of their savings to their new company, American Apple Orchards, Inc. They divide the company into 100,000 pieces ("shares") at $3 per share, with each man receiving half of the stock for his contribution. The new company uses the combined $300,000 to secure a $700,000 business loan. This gives them $1 million in cash and $700,000 in debt with a $300,000 net worth (consisting of their original contribution to the company). The company buys 300 acres of good farmland at $2,500 per acre ($750,000 total) and uses the remaining $250,000 for equipment, working capital, and start-up costs. The first year, the farm generates $43,000 in pretax operating profit. After taxes, this amounts to $30,000. At the end of the year, your father and uncle are sitting at the kitchen table, holding the board of directors meeting for American Apple Orchards, Inc. They see that the annual report the accountant prepared shows $300,000 in shareholder equity at the beginning, with a $30,000 net profit, for $330,000 ending shareholder equity. In other words, for all of their effort, they earned $30,000 on their $300,000 investment. (Instead of cash, however, the assets consist of farmland, apple trees, tractors, stationery, etc.) That is a 10% return on book value. If interest rates are 4% at the time, this is a good return. Not only did your family earn a good return on their investment, but your father and uncle got to live their dream by farming apples. Being older men and wise in the ways of the world, your father and uncle realize that the accountant left something out of the annual report. What is it? Real estate appreciation. If inflation ran 3%, the farmland probably kept pace, meaning that the appreciation was $22,500. In other words, if they sold their farm at the end of the year, they would get $772,500, not the $750,000 they paid, generating a gain on real estate of $22,500. The Choice They Face: Pay Dividends, or Reinvest in the Company? Now, your father and uncle have a choice. They have a business that has $330,000 in book value but that they know is worth $352,500 ($300,000 contributed capital + $30,000 net profit + $22,500 appreciation in land). So the accountant says their shares are worth $3.30 each ($330,000 divided by 100,000 pieces), but they know their stock is actually worth $3.52 per share ($352,000 divided by 100,000 pieces). They have a choice. Do they pay the $30,000 in cash they earned out as a $0.30 per share dividend ($30,000 net income divided by 100,000 shares = $0.30 per share dividend)? Or do they turn around and pour that $30,000 back into the business to expand? If the orchard can earn 10% on capital again next year, profits should increase to $33,000. Compared to the 4% the local bank pays, wouldn't they be better off not paying out that money as a cash ​dividend and, instead, going for the 10% return? Imagine that this conversation happens every year for the next 20 years. Every year, your father and uncle decide to reinvest the profit instead of paying a cash dividend, and each year they earn 10% on capital. The real estate also appreciates 3% per year. The entire time, they never issue, buy, or sell a share of their company's stock. On the company's 20th anniversary, net income is going to be $201,800. Book value, representing profits poured back into the company for expansion, would have grown from $300,000 to $2,000,000. On top of that $2,000,000, though, is the real estate. The land would have appreciated $605,000 from the first day of operation—not one penny of which has ever shown up anywhere in the financial statements. Thus, the book value of the company is $2,000,000 but the true value of the business is at least $2,605,000. From a book value perspective, the shares are worth $20 each ($2,000,000 book value divided by 100,000 shares). From a "real" value perspective, factoring in the value of the land, the shares are worth $26.05 each ($2,605,000 divided by 100,000 shares). If the company were to pay out 100% of its profits in cash dividends, cash dividends would be just shy of $2.02 per share ($201,800 net profit for the year divided by 100,000 shares = $2.02 per share cash dividends). 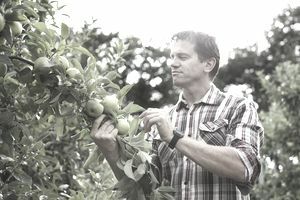 In practical terms, that means that the $300,000 your father and uncle invested into American Apple Orchards, Inc. when it was founded 20 years ago has grown to $2,605,000. In addition, the company generates $201,800 in net income each year. A reasonable, fair valuation of the stock when factoring in real estate appreciation is $26.05 per share. You want nothing more than to go into business with your father. You decide to approach your uncle and offer to buy his 50,000 shares, representing 50% of the business. In the 20 years since the company has existed, not a single penny has been paid out to the stockholders as a cash dividend. Would you seriously approach your uncle and offer to buy his shares at the original $3 purchase price when he and your father founded the company? Or would you offer to buy his shares at their current value of $26.05? In other words, if you paid $1,302,500 for 50% of a $2,605,000 farm, do you really think you'd feel like you were part of a Ponzi scheme because the money had been reinvested over the years? Of course not. Your money represents real assets and earning power, and you know that if you wanted to, you could vote to stop growth and start distributing profits as dividends in the future. Even though you haven't actually seen that money yet, it has represented a real, and tangible, gain in net worth for your family. On Wall Street, the same holds true for huge companies. Take Berkshire Hathaway, for example. The stock has gone from $8 to more than $317,000 per share over the past 40+ years because Warren Buffett has reinvested the profits into other investments. When he took over, the company owned nothing but some unprofitable textile mills. Today, Berkshire owns large chunks of great companies including American Express, Coca-Cola, Procter & Gamble, and many more. Is Berkshire worth $102,000+ per share? Absolutely. Even if it doesn't pay out those earnings now, it has hundreds of billions of dollars in assets that could be sold and generates tens of billions of dollars in profit each year. That has value, even if the shareholders don't get the benefit in the form of cash because the Board of Directors could literally turn on the spigot and start paying massive dividends tomorrow. In developed nations, with strong financial markets, the stock market will recognize this gain in value by rewarding a company with a higher stock price. Of course, this is irregular and can take years. But if you bought $8,000 worth of Berkshire back in the day, your 1,000 shares are now worth $317,000,000 (as of February 2018). If you desired, you could sell off several million dollars worth of stock, or put the shares in a brokerage account and take a small margin loan against them, to fund your lifestyle needs. In effect, you could "create your own" dividend. You could also donate your shares to a charitable remainder trust that will take your Berkshire stock, pay you a set return of, say, 5% per year, and then donate all of the stock to your favorite charity when you die. This is a do-it-yourself dividend method. How do you know if a stock will make you money over time?